You wanted the youngest, you got the youngest. KISS Kids are back for an encore this month with the release of KISS Kids #2. The stories are written by Chris Ryall and Tom Waltz with art from Jose Holder. Jeremy Colwell handles colors with Gilberto Lazcano tackling lettering. The first issue was a surprise hit, but can the four tiny terrors keep rocking? This issue features seven shorts varying between one and five pages. The gang head back to school, do a little homework, participate in the science fair, prepare for the battle of the bands, and hire some roadies to name just a few adventures. Science (Not) Fair and Rowdy Roadies are this issue’s standout shorts. 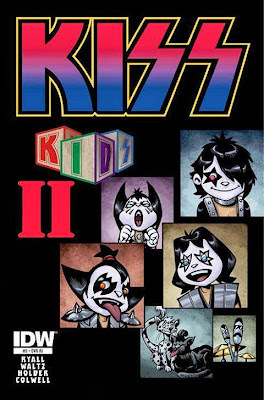 The two longer stories in the issue are chocked full of all-ages humor and a few jokes and nods to KISS, Gene Simmons, and classic rock in general. I did a double take when little Ronnie J.’s science fair project was about how he was the first to throw up the devil horns. When KISS stops by the school’s Rock and Roll Wall of Fame when they hear about the battle of the bands, they hope they can get into the illustrious club like a previous band called Crush. Ryall and Waltz write a fantastic issue. Last time I mentioned that the book lacked a little bit of a bite for older readers, but this time there are plenty of classic rock jokes and a few more completely innocent jokes that can be taken a different way by more experienced readers. Ryall and Waltz really rock out this month. Holder’s art is top notch. Holder gives you a perfect cartoony pint-sized version of the band. This one is a lot more action-packed than the previous entry, and Holder has a lot of fun presenting the hijinks the kids get into. Colwell’s colors are stunning. He keeps things bright, cheery, but also pretty well grounded. It’s bright and vibrant just as it should be.